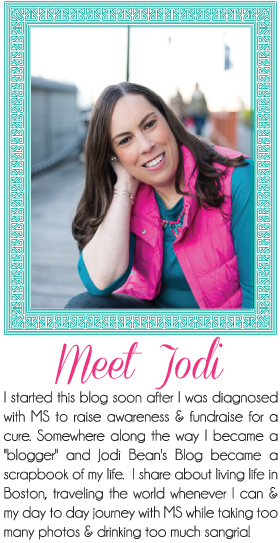 Last week I attended a shopping event for bloggers at one of my favorite stores, Loft. It was organized by Elissa who happens to work there and is a blogger and also Georgina. It was also Rachel's last night in Boston. Fortunately she was able to take a break from packing to come out with Emily and I (Kate couldn't join us b/c she was in Austin but we missed her). It was so fun to shop with so many blogger friends. Oh and champagne while shopping never hurts either! I really wanted one of everything. As soon as all the spring colors come out it is so hard for me to resist buying all of the clothes I see. I want spring here now! I love this look! Coral is one of my favorite colors for sling (along w/ mint) so I had to have this shirt and scarf. It is so cute together. Oh and my necklace addiction may be taken over by a scarf addiction. You can never have too many right?! We all ended up w/ some cute stuff and best part was we got a discount along w/ a savings card if you spend over $50 so I'll be back soon to use that! 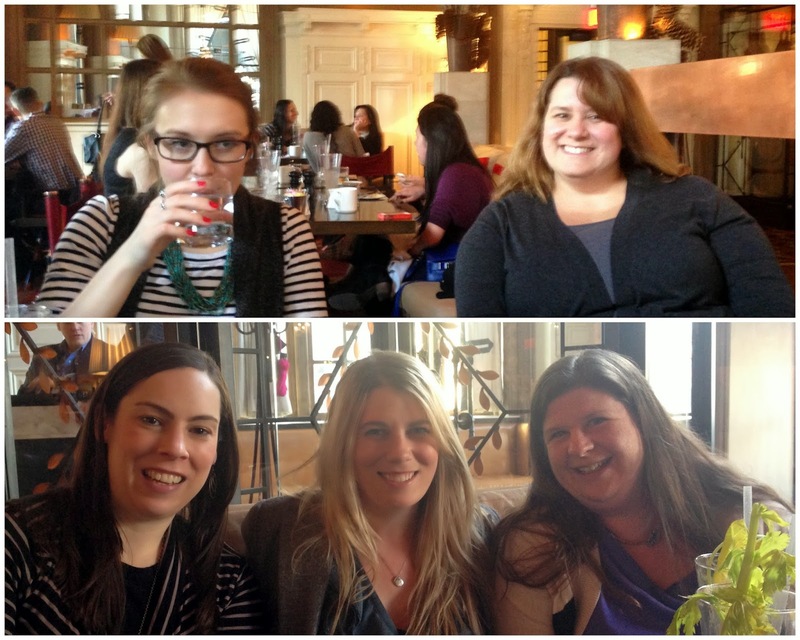 Sadly we had to say goodbye to Rachel as it was her last blogger event in Boston. Emily, Rachel and I were starving and went to PF Chang's after shopping to grab a bite to eat. It was packed and we couldn't wait so we sat at the bar. The bartenders (who looked like teenagers) were both jerks and pretty much ignored us. Then when we ordered water one of them gave us a hard time. Emily told him we had just come from an AA meeting. Seriously dude! Chill out! We were thirsty and wanted water. How did you know we weren't going to order a drink after!? Anyways we didn't b/c we were all just starving so we ate and chatted until it was time for Rachel to return home to finish packing. Luckily I'll see her in DC in 45 days for Cherry Blossom Festival. I can't wait. We are going to have so much fun!!!! On Tuesday night I went to dinner at Boston Chops with a few of about fifty of my friends who blog in Boston. 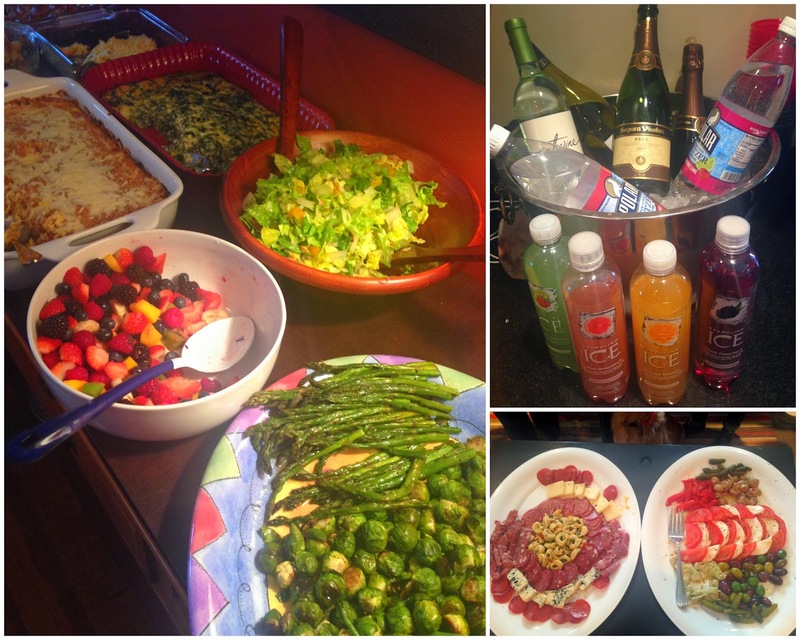 Organized by Georgina, it was a nice excuse to get out on a week night for great conversation and delicious food! Boston Chops is in the South End and has been open less than a year. It is a steak house which is likely why I had never even heard of it (since I don't like steak). I'm always up for trying a new restaurant and was excited to check it out. Georgina is such a good hostess and had our tables decorated beautifully! I enjoyed a delicious cocktail which I can't remember the name of right now and can't find on the online menu (sorry). It was so nice to catch up with Agnes again. We have met a few times before but I hadn't seen her in a while. My other table mates included El and Francesca. Francesca and I have been chatting online for over a year so it was so great to finally meet. El's sister and I work together which we figured out during dinner (small world) and I really enjoyed getting to know her. I hope to get together with both of these ladies again very soon! Oh and Francesca is a Stella and Dot stylist and you all know how obsessed I am with Stella and Dot! Georgina and Vanessa were also at our table. I've been friends with Georgina for a while now but it was nice to meet Vanessa for the first time. I continue to be amazed at just how many bloggers there are in Boston. 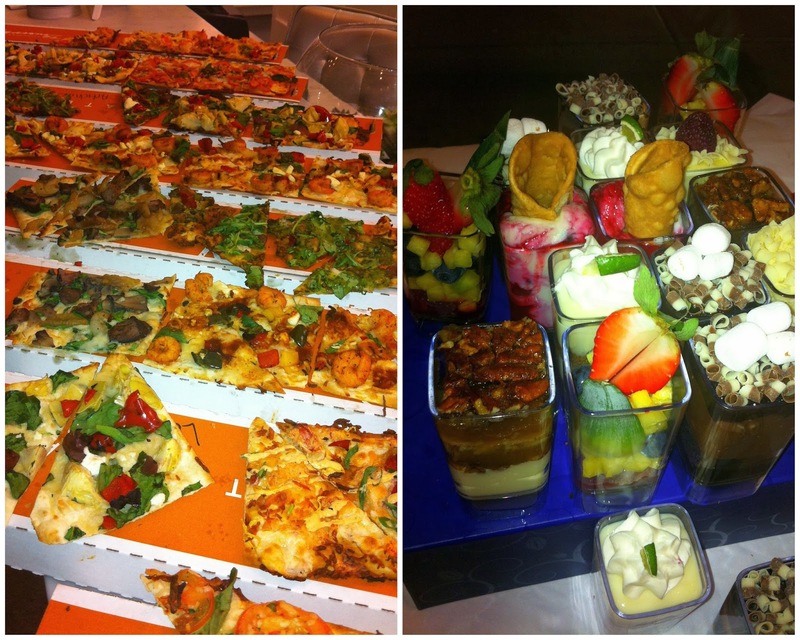 Food bloggers, fashion bloggers, beauty bloggers, lifestyle bloggers and all the other random topics we write about. Such an amazing community! Oh and I'm sure you want to know about the food right?! I ordered the Giannone Fried Chicken along with 2 others at my table (I guess we were the non-steak lovers table). 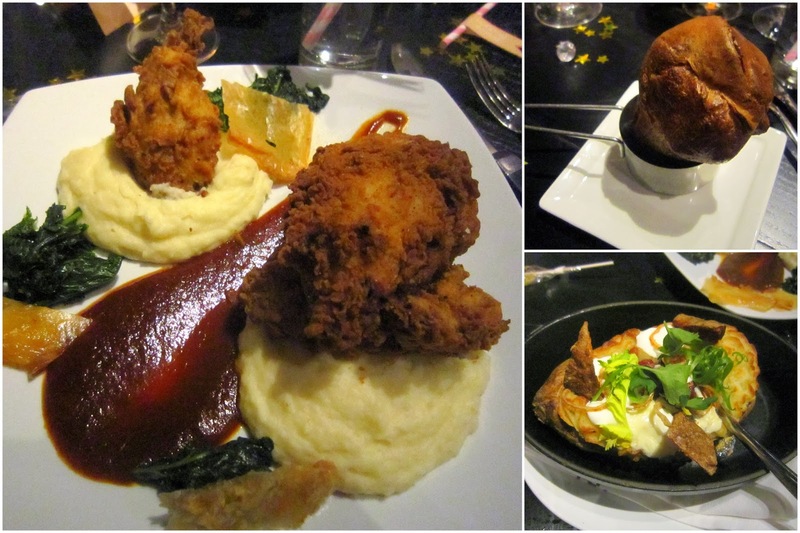 The chicken was delicious and I'm so glad I ordered it even though I was most tempted to just order that amazing twice baked loaded baked potato (bottom right photo). It was the biggest baked potato I've ever seen and I was jealous of the ladies at my table who got one! Can we talk about the portion size? HUGE! My meal was big enough for two or three people and I definitely did not finish it. I had plenty to take home. By the way this was not a free event. We all paid for our food and drinks! (I don't just go to the free events even though those are a nice treat)! 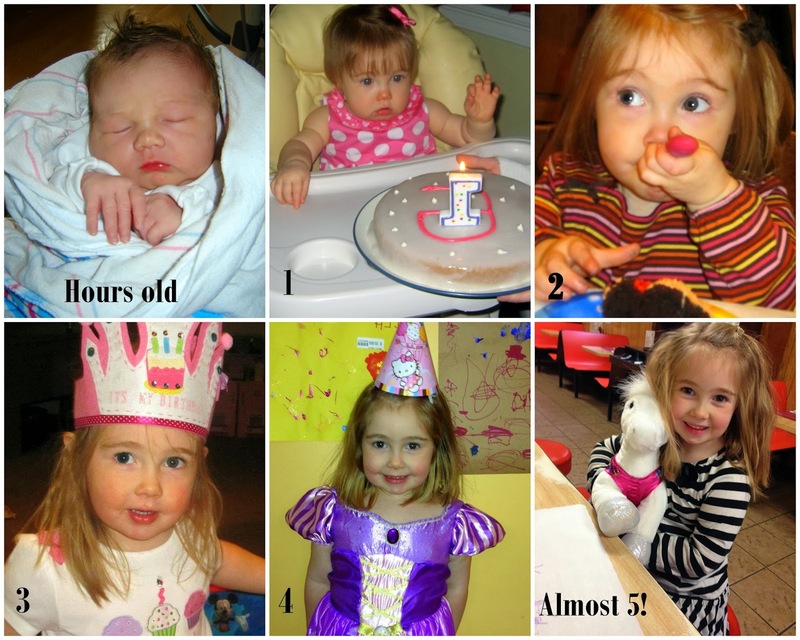 I really can't believe that my niece Ella is 5 years old today! I thought I would share some photos in honor or her big day. We'll be celebrating the Princess on Saturday with a party at her castle. 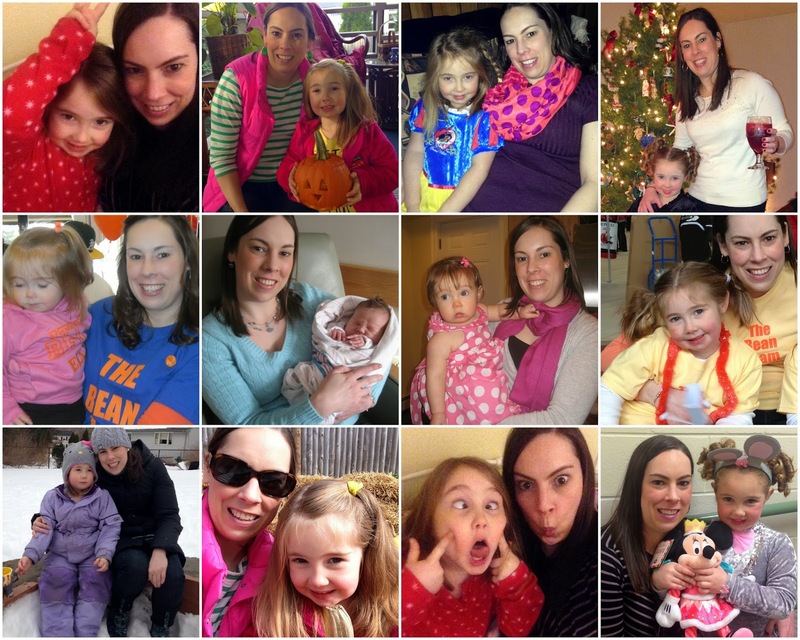 I've made her a special birthday banner that I can't wait to show you. . . I love this little girl so much! I can't imagine our lives without. She is funny and she knows it. She loves to dance and sing (loudly). She says some of the cutest, sweetest things that just make your heart melt. She loves unicorns and Sleeping Beauty. Happy Birthday Ella! I can't wait to celebrate with you on Saturday! 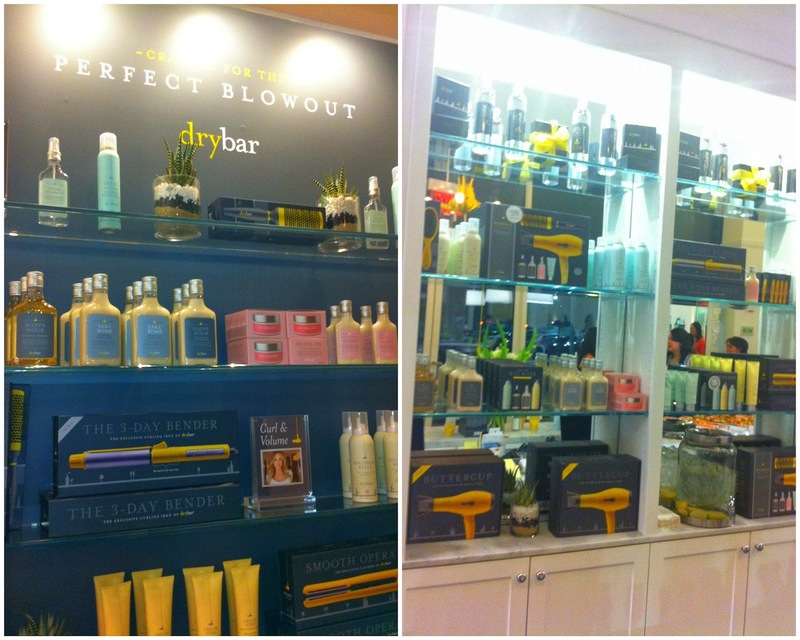 Last week I had the opportunity to try out Drybar in Chestnut Hill through a Boston Bloggers event. My blow dry was complimentary but all opinions, as always, are my own. As soon as I walked in the door I was warmly greeted by one of the "Bartenders." She asked me what I would like to drink and of course I chose champagne. She also took my coat to hang. Within seconds my stylist was introducing herself to me and walking me to a chair. Talk about fast service! I was actually disappointed that they were so fast because there was some yummy food out and I really wanted to eat it! Seasons 52 which also recently opened in the same plaza, provided the food. Flat bread pizzas and shot glass sized desserts. . . Yum! Thankfully there was still plenty for me to sample when I hair was complete! I really want to go to Seasons 52 for dinner very soon. I just love the atmosphere and decor in this place. It is trendy and upscale yet warm and inviting all at the same time. I love the grey and yellow color combo too! Isn't this hairdryer chandelier adorable? I love it! After I enjoyed a wonderful hair wash and massage I had my choice of styles. . . the Straight Up, the Manhattan, the Cosmo, the Mai Tai, the Cosmo-Tai, the Southern Comfort, the Hot Toddy and the Up-Tini. . . I choice the Cosmo which is "lots of loose curls." You can go here to see the descriptions of all the other styles. I loved my final look. I think it was really pretty. I only wish I wasn't going home to go to bed! Next time the event needs to be a pre-work event! Ha! After my hair was done I had a chance to browse, eat and mingle with some of the other bloggers. I really to buy one of everything. I hear rave reviews of the "Detox" Dry Shampoo and they even have a brunette version so you don't have to worry about the white powdery look. It wasn't in the budget this time but next time for sure! Oh and have you noticed all the cute names for the styles and products? I just love the whole "bar" these. So creative and fun. I had a chance to chat with several of the ladies there but was terrible about taking photos (I was using my crappy old iPhone since my is in the snowbank)! Thankfully Jill shared this one with me. Pretzel Crisps were there too! I love these things. If you haven't tried them yet you must. They are so good and I'm not a fan of "regular" pretzels! They are in the deli section of the grocery store. I got to take a bag home and I can't wait to eat them. This was a great event! I had such a fun time. If only I had someone to do my hair everyday. . . I guess then it wouldn't feel like such a treat though, right?! Drybar is $40 no matter your hair length. That includes a wash, blow dry and style. Well worth the money ladies! I can't wait to go back! P.S. This was my 2nd professional blow dry experience. 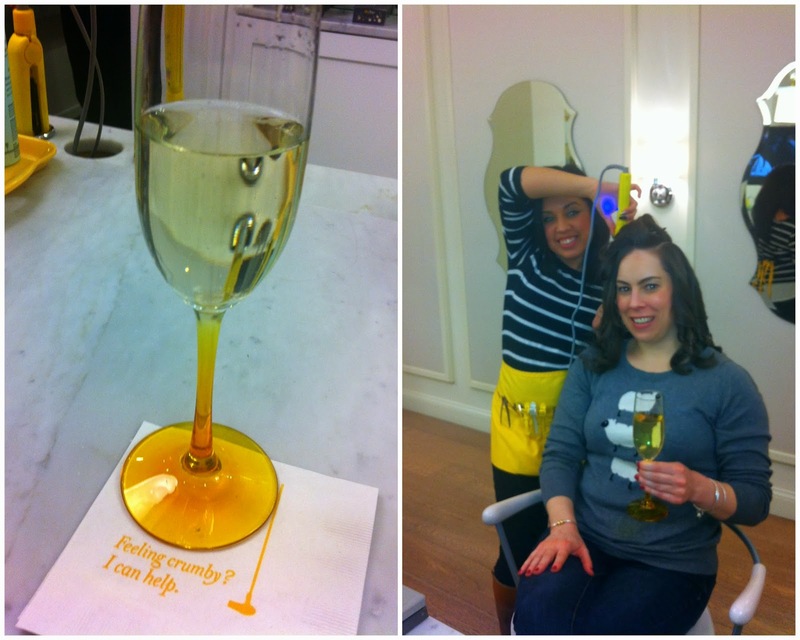 My 1st was at Be Styled also for a Boston Blogger event. If I was forced to choose I like the way my hair looked better at Drybar! Have you been to a Blow Dry Bar? 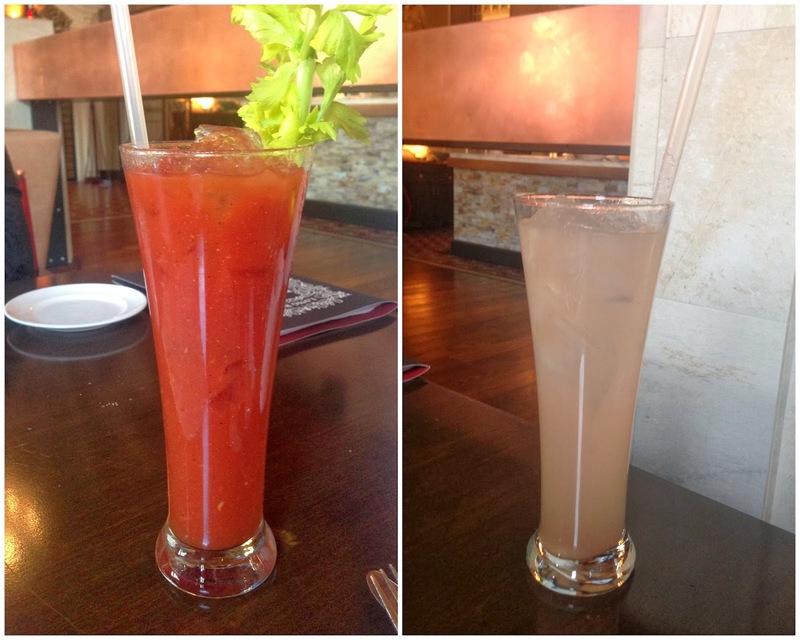 Last Sunday I had the chance to attend a Blog And Tweet Boston event at Oak Long Bar. Our brunch was complimentary but all opinions in this post are my own. Oak Long Bar is in the Fairmont Copley Plaza Hotel which I had actually never been in before. 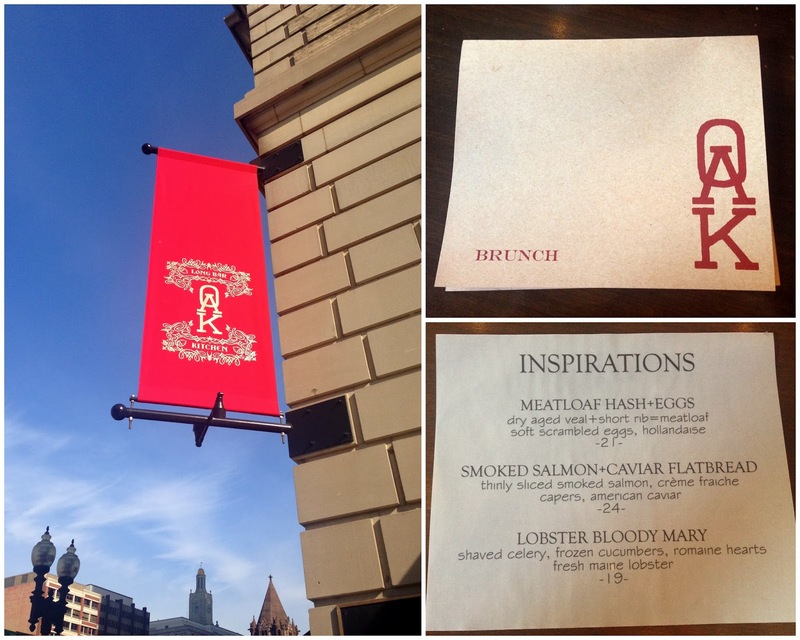 I'm so glad this event gave me the chance to try out Oak Long Bar because the brunch was SO good. It was a beautiful day in Boston and taking the T and walking through Copley Square was so nice. I just breathed in all the fresh warm air that I knew wouldn't last long (and it didn't). We started out with cocktails. Kate who sat next to me go a traditional Bloody Mary and I got the Presidential Bellini which had rum, prosecco and peach. It was good. I couldn't taste the peach at all but I like prosecco anytime! From looking around the room it appeared most people ordered one of the two drinks above. 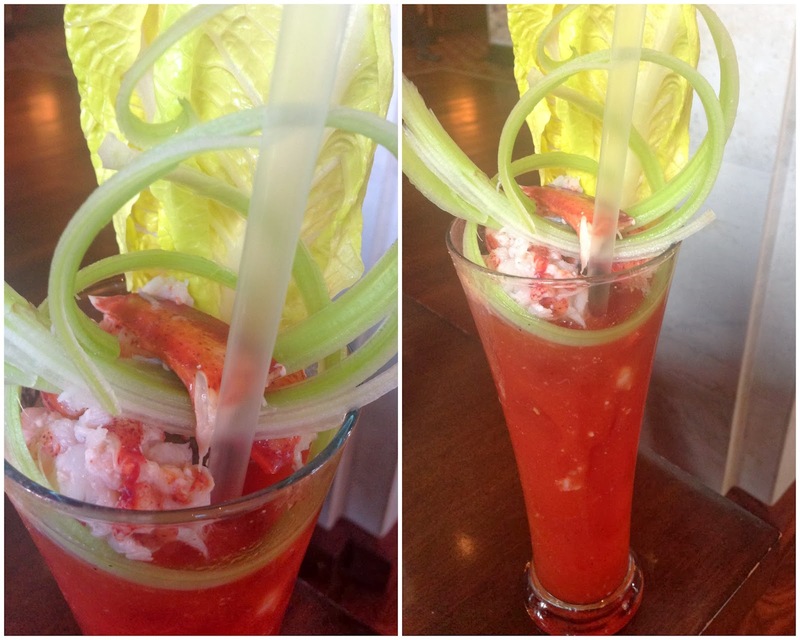 Suzanne, who works in PR for the hotel, was sitting at the same table and wanted us to try the special "Lobster Bloody Mary." It is $19 and loaded with fresh lobster. I don't like lobster or Bloody Mary's but Kate said it was delicious! Suzanne also recommended that we order a Charcuterie for the table and I'm so glad she did. It was delicious. We had the "Kitchen" size and it was plenty for the 5 of us plus some left over. I loved the cheddar cheese (cheated and ate dairy) and the fig spread was really good too. 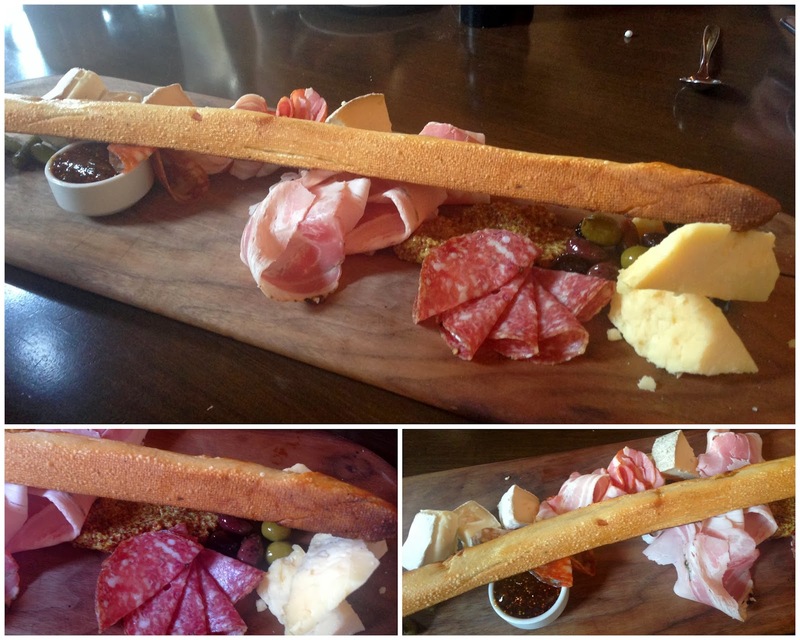 The bread in the top left photo was served right after our drinks came out and it was SO good. It was warm with lots of butter, sea salt and rosemary. It was served hot and didn't last long at our table. We each ordered an entree off the brunch menu. Can you guess which one is mine? I ordered the Chocolate Hazelnut French Toast and 4 big pieces were served to me. I could never eat all of that so it was a perfect opportunity to share with my table mates. It was so good! I also tried the blueberry pancakes which were delicious and if I ever go back for brunch I'm getting those! 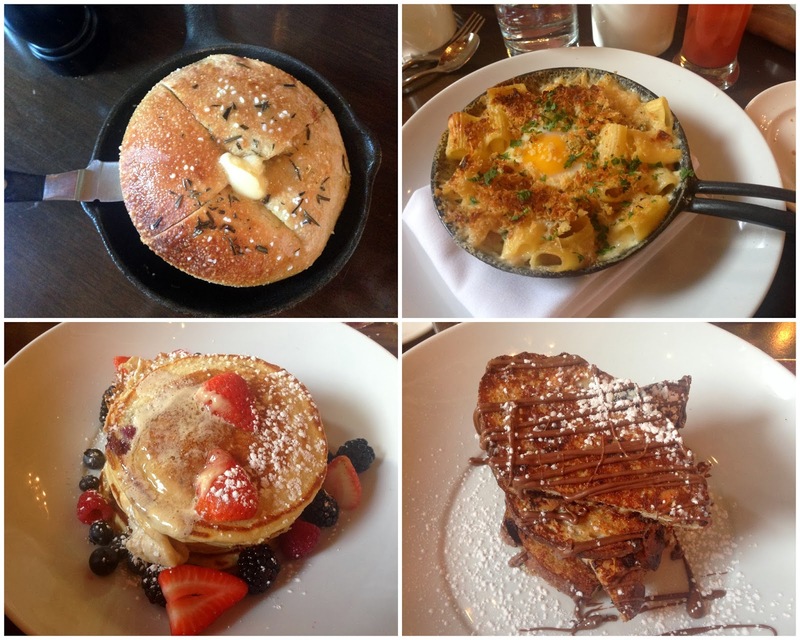 The top right photo is the Breakfast Mac and Cheese which 2 of my table mates got and said was very good. I don't like eggs so I'll take their word for it. My table mates: Lindsey (top left), Suzanne (top right), me, Kate (bottom middle) and Leah (bottom right). It was so nice meeting a few new people and of course spending time with Kate too! We all had great conversations about two of my favorite things - travel and food. We made a great group! This hotel opened in 1912 and while it has an old and elegant charm it is modern at the same time. The bar area is very trendy and I can't wait to go back for happy hour. I'm so glad I went to this event because I don't know if I would have ever thought to check Oak Long Bar out and now I can't wait to go back. Kate and I have been talking about it all week! Sadly I totally forget to visit Catie Copley and Carly Copley which I am so sad about. I knew that they had these 2 adorable dogs but I totally forgot until after I was already home. So just another reason to go back for a visit. I am a dog lover and thing it is so awesome that they have these 2 dogs at the hotel for guests to enjoy. If you don't know what I'm talking about read more about them here. Thank you Blog And Tweet Boston for organizing and thank you Oak Long Bar for having us! I'll be back for sure! 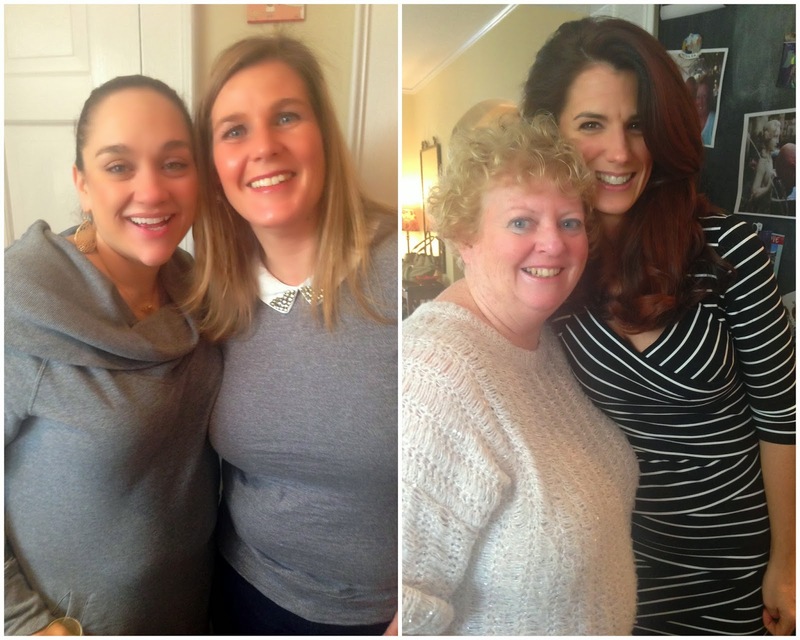 On Sunday the Fashion Plates Committee hosted our annual "wrap-up" brunch. We always wait until after the holidays to get everyone together to celebrate the event. It was so nice to see so many committee members and models there. Fun to catch up after not seeing each other for a couple of months! 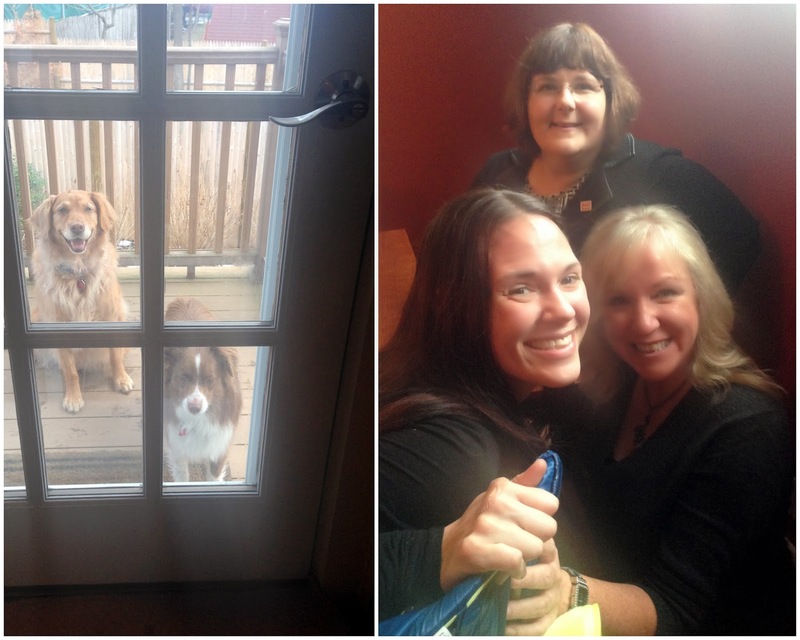 Piper is always willing to open up her home and we spent the day eating, drinking and chatting. Such a great time with incredible women! I made an amazing cinnamon bun french toast casserole. Katie gave me the recipe and everyone LOVED it! I can't wait to make it again! Piper and Tami's dogs always go a bit crazy while everyone is arriving. So they got sent outside and both sat and stared at us until we let them back into the party. Too funny! So on a totally unrelated note. . . today I had to go to an all day training in Boston and it started at 8 AM. We were getting a big snow storm with the worst of it being during the morning commute. So I made sure to allow for extra time to get there. I left my house at 7 AM and got there in 30 minutes. I parked and realized I didn't have my phone. I KNOW I put it in my pocket before I left but it must have fallen out when I was shoveling/cleaning off my car. So I go into training and there are no computers anywhere for me to hop on. I was freaking out knowing it would get buried in snow when the snow plows came. I didn't know anyone there but I asked the woman next to me if I could use her iPhone to send an email (I explained the situation). I actually sent 2 - one to my mom so she wouldn't worry if she tried to text/email me and one to the condo association president. She doesn't live in the building but I wanted to let her know in case she was coming over. I don't know anyone I live with so there was nobody I could contact to look for it. So needless to say by the time I got home at 5 PM there was a foot of snow and little hope of finding it. The "find my iPhone" feature is great. . . kind of. It shows me my phone is indeed at my address but it is not very precise. I have no clue where it is. I've "pinged" from my laptop about 50 times and can't hear the noise inside or out. I'm guessing it is in a snow bank. I'm so upset and mad at myself. I shoveled for over an hour looking for it and no luck. So please pray to St. Anthony for me! Oh and pray that the snow all melts tomorrow (little hope of that considering the temps)! If it was a normal day I would have just driven home from work to look for it in the morning. But I couldn't do that since I was at this training. SO SO frustrating! Fingers crossed I can still find it and soon b/c I can't live w/o a phone and I have NO home phone!!!! BAD DAY! Trying to focus on the positive. Trying really hard. . .
Friday night I went to see Lady Antebellum in concert for their Take Me #DownTownTour and it was AWESOME! Kate, Emily and I bought the tickets back before Christmas and at the time I felt a bit guilty spending the money but I'm so glad I did because it was SO worth it! Kate's sister joined us too and we all had so much fun. Kacey Musgraves and Kip Moore were the opening acts. We missed seeing Kacey since we stopped at a bar first for a quick drink and bite to eat. We got there in time to see Kip and he was great. Such a cutie and several great songs! I got to wear my cowboy boots for a 2nd time! Hoping to get much more use out of them soon since Emily, Kate and I have some more country concerts in our future!! Our seats were actually pretty good for the balcony! We were directly across from the stage with a great view! Oh and none of us fell to our deaths in those steep seats so that is an added bonus! Love these two blogging friends turned real life friends. We have lots of laughs together. Emily asked Kate and I if she is uptight (kind of as a joke in context to the conversation we were having with the strange waiter) and I think we both almost choked on our nachos! Emily is the most un-uptight person I know and I love that about her! Kate and I both needed a good laugh after our work weeks so we can thank Emily for that one! Emily wanted to prove to us that she is the best at taking selfies and I think I would have to agree! Not bad! Remember in the old days when everyone had lighters at concerts? Well now everyone has smart phones. Not quite the same look but still kind of pretty! Such a great night! I love Lady A and I'm so glad I got to see them live. If you have the chance I recommend seeing them. They put on a great show! 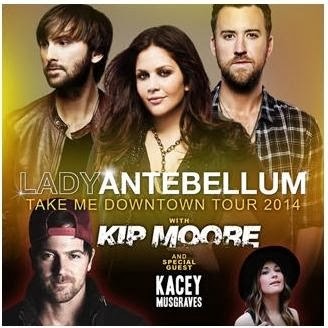 Have you seen Lady A in concert? What other country artists are a "must-see" live? !